Actually some doctors in Spain recommend acorn-fed Ibérico Ham as part of the diet to lose weight. Ibérico breed pigs enjoy every day during the Montanera season an astonishing average of 20 pounds of acorns a day, and they do a lot of exercise to find them. The unique metabolism of the Ibérico breed, transforms the acorns (bellotas) into delectable fat made of Oleic Acid (like olive oil). A good acorn-fed (bellota) Ibérico ham has marbled meat and a lot of delicious and healthy fat that is unique to this grade of ham. Each gram of fat provides more than twice as much energy as carbohydrates or proteins. Fat also has a protection function in our bodies (without fat some of the vital organs of our body, like the kidney, liver or heart, would be likely to change its correct position, as is the fat that keeps them in place). Other positive features of lipids and fats contained in jamón Ibérico de Bellota, which are beneficial to the body, are the contribution of thermal insulation and the contribution to food texture; or its ability to increase feelings of satiety. Scientific studies have shown that the fat of acorn-fed Ibérico ham contains over 50% oleic acid, which is responsible for reducing bad cholesterol and boost good in our body. It also provides calcium, protein, iron, phosphorus, sodium, potassium, and vitamins B1, B6 and B12. The fat of acorn-fed Ibérico ham provides a unique flavor, aroma and texture that you won’t find in any other cured meat. And besides that, it is very healthy for our bodies. So go ahead and enjoy the uniqueness of Jamón Ibérico de Bellota. 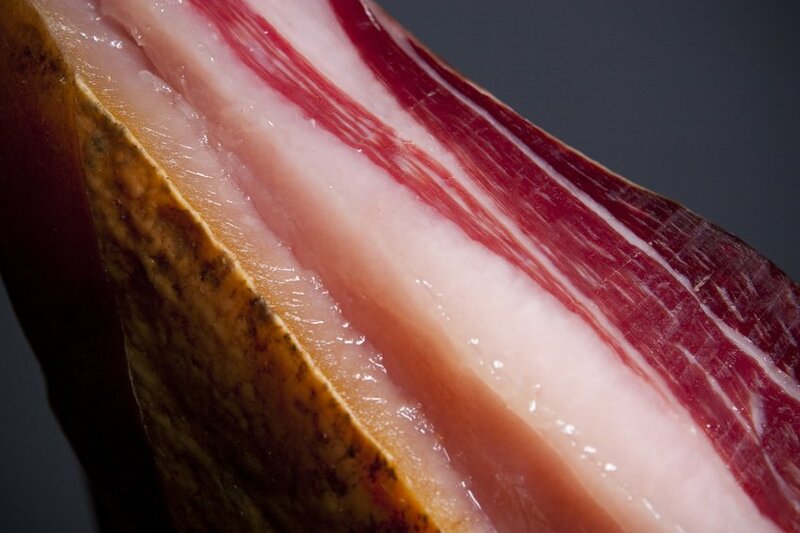 More info about Iberian ham health and nutrition.